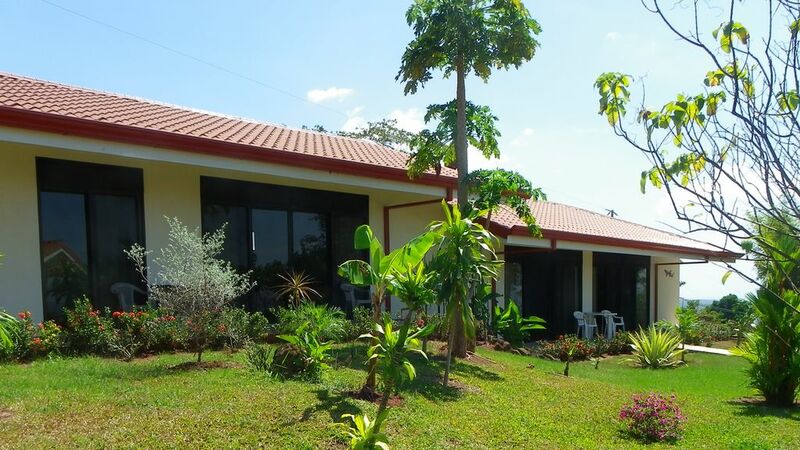 The property is located in the central Pacific area just up from the Puntarenas city area near the small town of San Miguel. We are approximately 1 hour from the San Jose airport or 2 hours from the Liberia airport. It is about 15 minutes to the ocean and around 25 minutes to downtown Puntarenas. There is an infinity pool which overlooks the valley and the ocean. The room is fully furnished and includes a small kitchenette, bathroom with shower, 2 double beds, a small dining area, a television and sitting area outside the cabin. There is WIFI internet and telephone available. We have contacts with several local cabbies that speak English. They will pick you up and drop you off at the airport and will also provide tours of the local attractions for much less than the tour companies. Some of the attractions are canopy tour (zip lining), volcanoes, national parks, coffee plantations, orchid farms, fishing, boat tour to Tortuga Island and many more. We have been on most of the tours and they are good. On any given day, from the cabin, you can see a large variety of birds with many different colors. Taxis are relatively cheap and there is a local bus which can be flagged down in front of the property and take you down to the center of Puntarenas for less than $1. The bus lets you off at a good sized market, stores for shopping and is close to the banks with ATM’s. Close to our property (15 minutes away) there is a farmers market open Friday afternoons and Saturday mornings where you can buy most of the groceries you will need at reasonable prices. US dollars and the local currency (colones) are used through out the country. If you need any other information let us know and we will get it for you. We can provide therapeutic massages by appointment. There is a 99% chance there will be a beautiful sunset every day between December and April. Excellent Host and a wonderful property. We had a very nice stay and Ted and his wife were both very accommodating. The property was very clean and well maintained. Ted and Irene's apartment-style accommodations are comfortable and modern, and the kitchen is very well equipped. My husband also said they have the best pillows ever! The infinity pool is gorgeous (definitely cooler than most places but you get used to it), and the view of Puente Arenas is incredible. Ted took us on a money tour where we got to hand-feed wild white-faced monkeys as they climbed on our shoulders - BEST part of our trip so far! And they suggested we go to the Natuwa reserve and it was definitely well worth going. We spent some time down by the cruise ships and took a stroll thru the aquarium which was a bit sad but worth the $10 if you have time to kill (the buildings are air-conditioned and have the best stuff to see). The road to San Hose (to the airport, Walmart, etc) is gorgeous. Good/smooth, twisty roads with great views of the hills and valleys. We also hung out by the town square of Esparza (next town over) one Friday night around supper time - the locals were out relaxing and visiting with each other, and we really enjoyed the peacefulness of it. Puenta Arenas isn't the place to go for gorgeous beaches, but it's an interesting place. Ted and Irene will answer any questions you have and are great hosts. We definitely recommend Iguana Negra! Came back for the visit. Friendly hosts, great place! Ted & Irene have an inviting and friendly escape at the top of the hill and through the gate. The accommodations are simple and well maintained. The grounds are lush, clean & safe. We enjoyed the beautiful pool and patio. The up country of Barranca is convenient to many local sites and Ted/Irene can give you great advice. Take him up on his monkey tour! Thanks again for opening your home to us! We stayed about 9 days & had a great time. The property is beautiful, the view from the pool is amazing, and the owners were very helpful & friendly. They arranged a snorkling trip that was a lot cheaper than what's available online & took us on a monkey tour. I would definitely recommend this property to anyone looking for a beautiful & affordable place to stay. ZIP Lining (Canopy tour), Tortuga Island tour, Fishing, Volcano tours, Coffee Plantation tours, National Parks, Golf and beaches. All of these activities are within an hour or an hour and a half away and most of them are much closer.